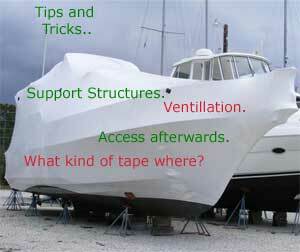 - Is Shrink Wrap Difficult to Use? 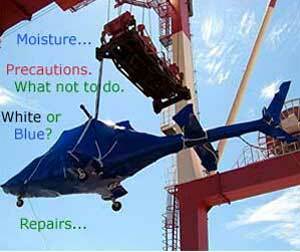 - What shrink wrap color should I use? White, blue, clear? - How do I choose what size shrink wrap to buy? - What tools will I need? - Can the heat tool cause damage? - How do I repair a tear or burn hole in the shrink wrap cover? - Can I get inside after shrink wrapping? Learning how to apply shrink wrap properly is important. Installing the shrink wrap cover correctly the first time is the most important component to achieve stability and security with for your shrink wrapping project. WARNING: Shrink wrap can burn. If heat is applied incorrectly, shrink wrap can ignite into open flame. It can also drop down onto other combustible material and cause secondary ignition and fire. If at any time you observe the shrink wrap on fire, immediately address the issue. Then carefully inspect the area where you are working for a possible lingering fire. Keep a fire extinguisher available at all times. Inspect the cover for up to 30 minutes after shrink wrapping to look for hot spots.